Almighty and ever-living God, as Your only-begotten Son was this day presented in the temple in the substance of our flesh, grant that we may be presented to You with pure and clean hearts; through Jesus Christ, our Lord, who lives and reigns with You and the Holy Spirit, one God, now and forever. Here was a 40 day old infant, not potty trained, born in poverty, with his poor parents and this crying Child is being sung about as, “…a light for revelation to the Gentiles and for glory to Your people Israel“? A child has achieved nothing and yet has received everything with no choice in the matter. The Child had not demonstrated wisdom nor talent nor anything to earn an accolade, not even the praise of being born for that praise of labor belongs to the mother. Later Jesus’ disciples would say of the Temple in marvel at it and say to the Lord, “…Look, Teacher, what wonderful stones and what wonderful buildings!” (St. Mark 13: 1). What did this Child compare with the magnificent Temple in which the Presentation occurred? How did a poor child compare with one of the wonders of the ancient world? What did Simeon see in the Child that he sang that the Child is “…a light for revelation to the Gentiles and for glory to Your people Israel”? He did. 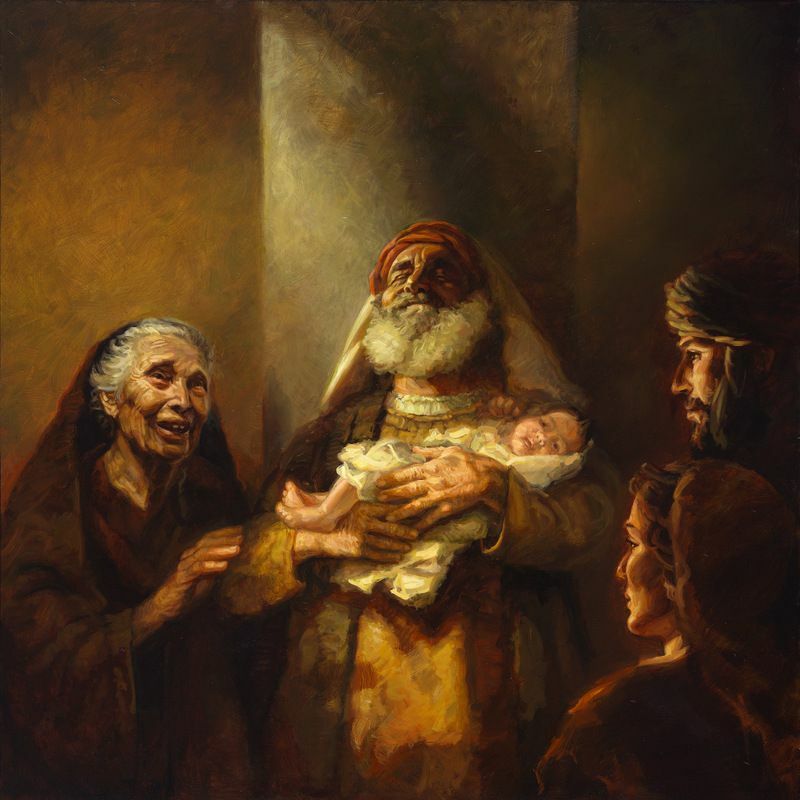 How did Simeon see this in the Child presented this day in the Temple? We are told earlier in Luke chapter 2 about Simeon that “…the Holy Spirit was upon him.” (vs. 25.) The Holy Spirit taught Simeon, Behold, Simeon you have seen the Christ! The light and revelation of Jew and Gentile! “But the Helper, the Holy Spirit, whom the Father will send in my name, he will teach you all things and bring to your remembrance all that I have said to you.” (St. John 14: 26). The Holy Spirit witnesses and teaches through the Word alone of Jesus Christ. This is the way Simeon knew the Child was and is the One. “…for my eyes have seen your salvation”. The magnificent Temple and its wonderful stones did not save. It is the Lord, whose house the Temple was, alone saves, presented in His Father’s House for us and for our salvation. In Him the fullness of the Godhead was pleased to dwell. Our church buildings, our church polities, our denominational stratagems, our good works, our self-chosen spiritualities do not, can not and will not save. They are to point to the Holy Trinity and not our selves. Here is God deep within human flesh, born under the Law to redeem us, presented that day in the Temple for us and for our salvation. “The deeper we plunge Christ into the flesh of mankind, the better for us.” (From Luther’s House Sermon on the Presentation, 1537) He who needed no sacrifices to be made pure is the Sacrifice to make us pure. Outside of the Christ is only darkness. In Him, love’s pure light shines.